Who discovered the Rosetta Stone? 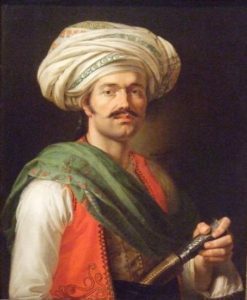 My next project will likely be an anthology of accounts by those who accompanied Napoleon’s expedition to Egypt in 1798. These accounts combine the experience of soldiers in an unfamiliar and harsh environment with recollections by civilian scientists and scholars tasked with studying contemporary and ancient Egypt. I have already published a book on Napoleon’s Mameluke, Roustam Raza, a gift to the general by one of the governors of Mameluke Egypt. The biographies of those who sided with the French and left with them, later forming a unit in Napoleon’s Guard cavalry, can also be found on this site. Napoleon’s invasion carried thousands of French soldiers (and dozens of scholars) eastwards into what were unknown lands. What they saw and experienced there made a lasting impression on the survivors. Although it came as a brutal shock to most Egyptians, the French invasion did at least have its upsides. Europe learnt a lot about Egypt in the three years the French were there, and the invasion contributed some facts to Europe’s longstanding curiosity about the Levant. France gained in culture and knowledge. The scholars who accompanied Napoleon made some important discoveries. Some were accidental. Here is one example, the story of the man who discovered the Rosetta Stone. Some were less interested in Egyptian culture, and preferred to listen to Haydn in Cairo of classical music in Egypt during the campaign. Another positive was that the French brought important technology with them. Here is an article on the printing presses dragged across the sea to Egypt. Ultimately, the French invasion led to a French defeat and evacuation. Napoleon had been the first to go. Here is Roustam Raza’s account of Napoleon’s own flight from Egypt.